You’ve heard about the indoor skiing and fancy restaurants of Dubai. 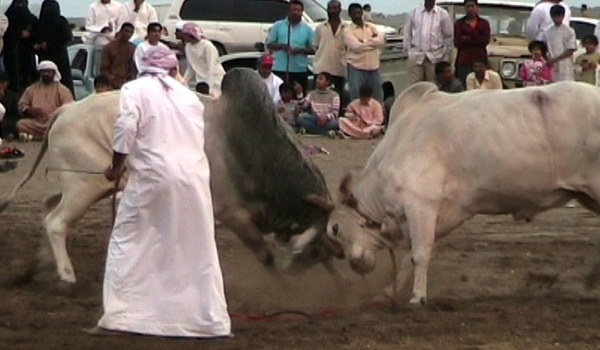 For an authentic Middle Eastern experience, however, check out traditional bull wrestling. Between the waters of the Gulf of Oman and the crags of the Western Hajar Mountains, you’ll find a distinctly Arabic pastime: bull wrestling. Every Friday, prized bovines are trucked in from all over the Emirates and the neighboring Sultanate of Oman to the bull wrestling capital of the Arabian Peninsula: Fujariah, United Arab Emirates (U.A.E.). Huffing, snorting and puffing themselves up, these hump-backed Brahmin bulls aim to psych out their opponents long before being led to the ‘ring’. The ‘ring’ (which consists of nothing more than a dirt field) lies between a white sandy beach and a black-top road leading to the Omani border. 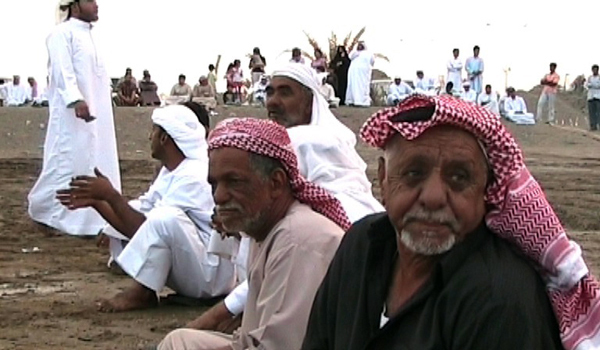 Picnicking spectators line the perimeter in clothes that have been worn for centuries in the Gulf: colorful turbans, dark veils, white dishdashas (male shirt-dresses) and black abbeyyas (flowing female gowns). Amidst this millennium-old tradition (Arabian bull fighting purportedly predates Islam), twentieth century flourishes pop through here and there: a video camera phone in the henna painted hand of a veiled woman; an electronic bullhorn in the MC’s grip; Hummers and Mercedes in the sand parking lot. The announcer gives a frenzied blow-by-blow report of the head butts and the crowd jostles for position. Warily pulling smoke from their wooden pipes, owners carefully watch the action. Trainers stand at the ready. Like a sumo wrestler, the bull that loses ground or turns tail and backs down forfeits the match. Unlike their two-legged Japanese counterparts, however, these bad boy Brahmins have to have their horns forcibly unlocked even after a winner is announced. Corner men, trainers (and spectators even) rush in, grabbing the bull’s tethers. A tug-of-war between man and beast ensues. This gets the crowd going almost as much as when a tug-of-war participant loses his footing and soils his dishdasha. As the sun dips below a blue horizon, the lawn chairs, rugs and picnic baskets are packed up as unceremoniously as the bulls are loaded into Toyota pick-ups. The big boys of the U.B.F. (Ultimate Bull Fighting) circuit can now look forward to another week of pampered bliss: milk, honey and relaxation amidst the verdant palm groves of the U.A.E. Who? You, the next time you’re in Dubai. When? Every Friday from 4-7PM. Where?Fujariah, on the East Coast of the U.A.E. How? In a shared taxi from Dubai, costing about 25 Dirhams. Why? Because if you haven’t experienced what makes a place unique, have you really experienced it? Be sure to read Baxter Jackson’s essay Muslim Fear: How Teaching In Oman Taught Me The Shades Of Islam.